Two friends of mine are headed on a wee vacation to O’Land o’ Ireland, home of the pint, Angela’s Ashes, Celtics, Aran sweaters and shamrocks. I was lucky (Irish luck?) enough to have taken a similar vacation a few years ago with a friend of mine, over St. Patrick’s Day, partially-paid by my company. 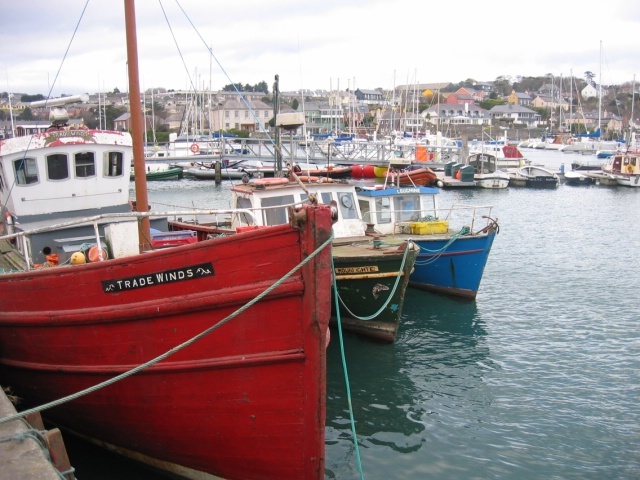 She and I rented a giant Ford Galaxy that seated eight, since it was the only rental car available with automatic transmission, and we set off from Kinsale (photo, below) north to Galway (photo right). In this entry, I will create a Do and Don’t separation for Ireland. DO realize that this trip is usually best taken with a significant other, due to its country cuteness, cozy bed & breakfasts and tranquilizing scenery. DO realize that if you’re not traveling with a significant other and you’re both under 50 years old, you may get bored quickly. Keep driving along. DO rent an automatic transmission car, unless you are ambidextrous and can drive stick-shift with your opposite hand (unless you’re English or Japanese, in which please drive as you ordinarily do). Remember that the Irish are one of the cultures who drive on the left. 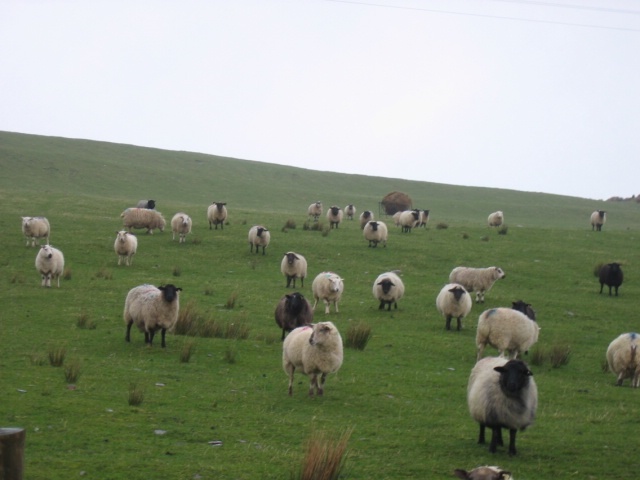 DO try the local brews and whiskeys – after all, this is Ireland! but then DON’T try to drive on the opposite side of the road afterwards. DO buy at least one Aran sweater. 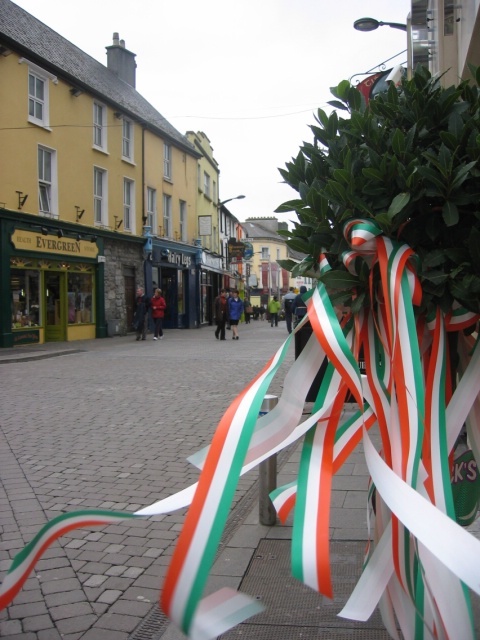 DO visit the Ring of Kerry and Dingle Peninsula. Do drive it yourself so you can decide your schedule and whether you want to get off or stay on the road. Don’t bother with the bus tours which will just tell you “here is something pretty – now get off and take a picture of it” unless you plan to be drunk at lunch and can’t continue to drive. DO admire the scenery at Dingle: as I wrote in an email to a friend, “one point there was nothing but waves thrashing in slow-motion against black rocks in the blue-purple, almost amethyst, ocean, and then if you look to the right was a continuum of green hills dotted with puffy white sheep that looked like clouds.” (I was inspired by all the literature in Ireland. I don’t ordinarily write such florally emails to my friends). DO note the wealth of literary types and writers from Ireland, and visit the Literary Museum in Listowel. It only takes an hour and pays tribute to the various famous Irish writers. 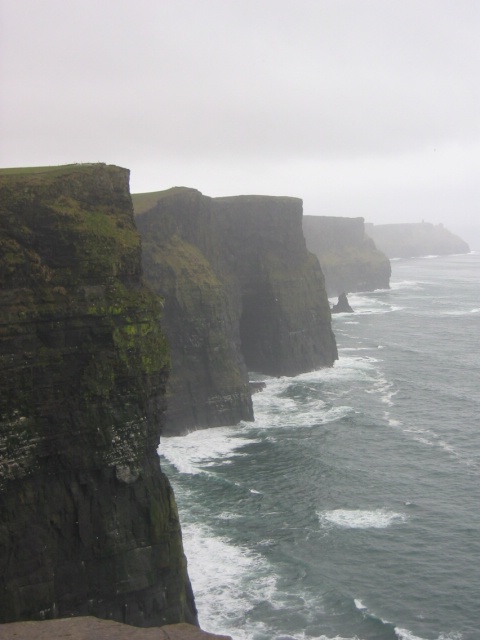 DO visit the Cliffs of Moher (photo, left) for some equally dramatic ocean-pounding action and pictures. It will be windy. DO drive through the Burren (limestone-covered hills) to Galway. DO hop the ferry over to Aran Islands and rent bikes to cycle around. 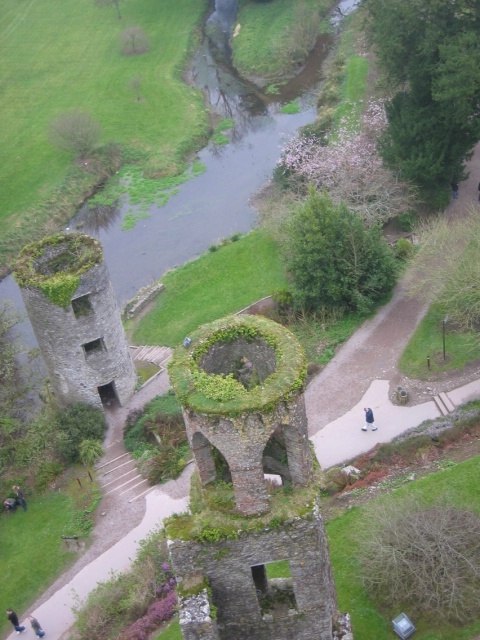 DO visit the Blarney Castle (photo, above). In the interest of H1N1, DO NOT kiss the Blarney Stone. You will not get bad luck (but you might get the flu). DO check out the city of Cork which has lots of interesting restaurants (including some very tasty Indian food) and shops. DO keep in mind that “Mna” means “women” and “Fir” means “men” when trying to choose a restroom in Gaelic. DO try to squeeze in a quick train trip to Dublin. A lot of people skip this because they want to just focus on the western part of Ireland. 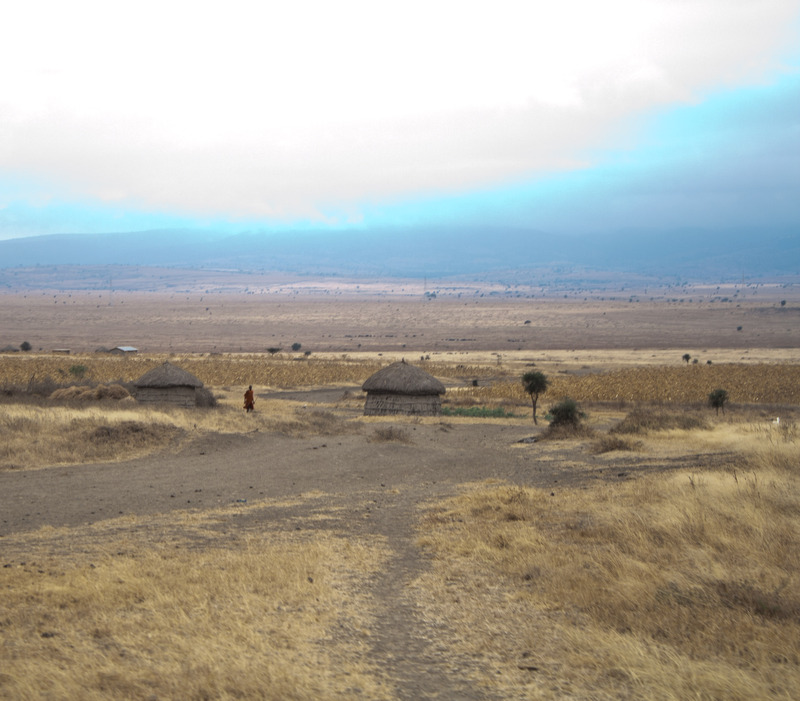 The western part, to re-emphasize, is kind of slow if you’re a faster-paced and young traveler. 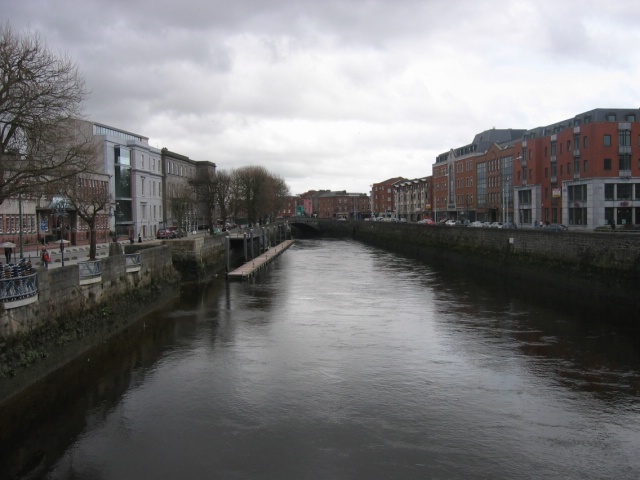 Dublin is the main city in Ireland and would be a good complement to the rest of the country. I hear the literary tour is worth it. 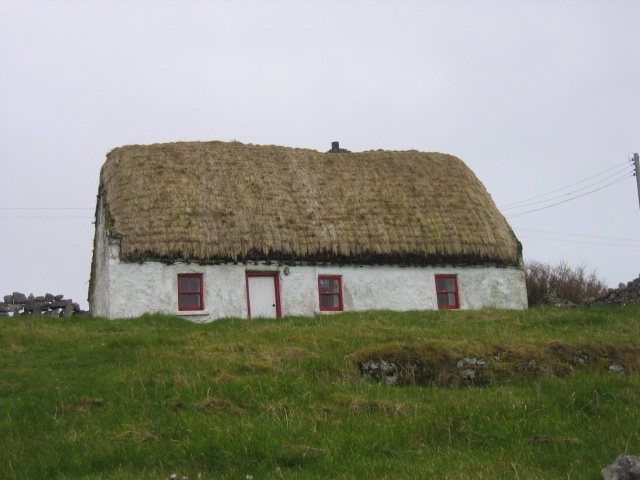 below: house on Aran Islands. Now that I’ve been snowbound at home here in Baltimore for six days straight, the only activity outside the house I’ve had is shoveling snow, eating burgers and going to hot yoga. Though I love snow, I really do, and I love having days off from work (thank you, federal government), I think the hot yoga is leaving me a little dehydrated and perhaps hallucinating of warmer places. After listening to yoga instructors pretend to speak Hindi and be Indian because they can hold themselves upside down on two pinkies, I’ve decided to transport myself to the birthplace of hippiedom, the grand poomba of American yogism, and the great center of full-moon parties: Goa, India. Yes, so Karen is part-Goan. She says it’s complicated to explain her whole background, so she just says Portugese. And that’s the quick history of Goa: Portugese missionaries came down to convert the Indians into Catholics and build churches and breed generations of exotic-looking people. 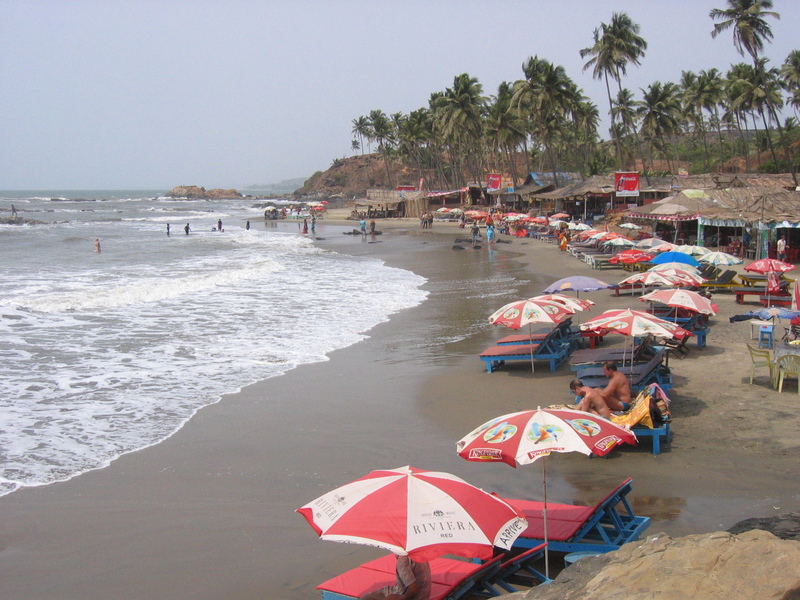 Then around the 1960’s, another exotic-looking group of people descended upon the beaches of Goa and gave it the reputation it has today – a nirvana for flower children, floursack pant-wearing stoner hippies who dred their hair and party every night, full moon or not. Beaches. There are many. We rented a scooter and scooted along the coast to explore; many had shack-like hotels and restaurants right on the beach. The Baga-to-Calangute area north of Panjim is a ridiculously touristy section that, even if you’re not totally looking for Nirvana, takes away from any restful experience you might have been hoping for. Skip ahead towards the beaches north of that, and the farther north you go, the more rustic and secluded it will become. Where to stay. In high season, it’s advisable to make a reservation, but if you’re okay with abandoning your original plan and checking out other places, you can. Many beaches come with little huts for very little. We stayed in Anjuna in some $6/day hotel on the beach (I can’t remember the name now but I would not really recommend it) that gave us our own little one-room, two-bed house with one bedsheet each but a full bathroom, even if it came with a frog and a giant cockroach. Though the room did not give me much sleep, the beachview balcony and menu of Indian-or-Chinese food did. Old Goa. 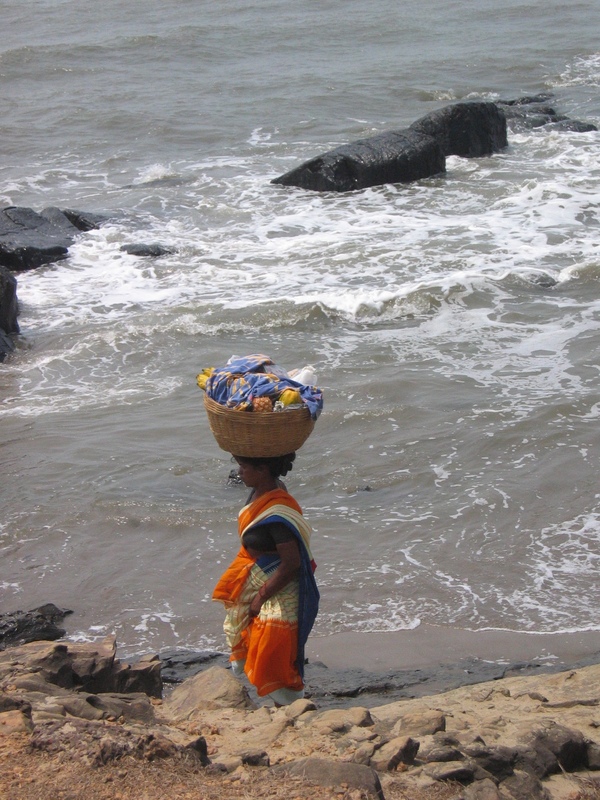 For some history and culture, check out Old Goa inland. It’s muggier and hot, but you can find refuge inside a cool stone church, which was my theory on how the Portugese managed to convert so many Indians (“we offer you our Lord and air conditioning”). 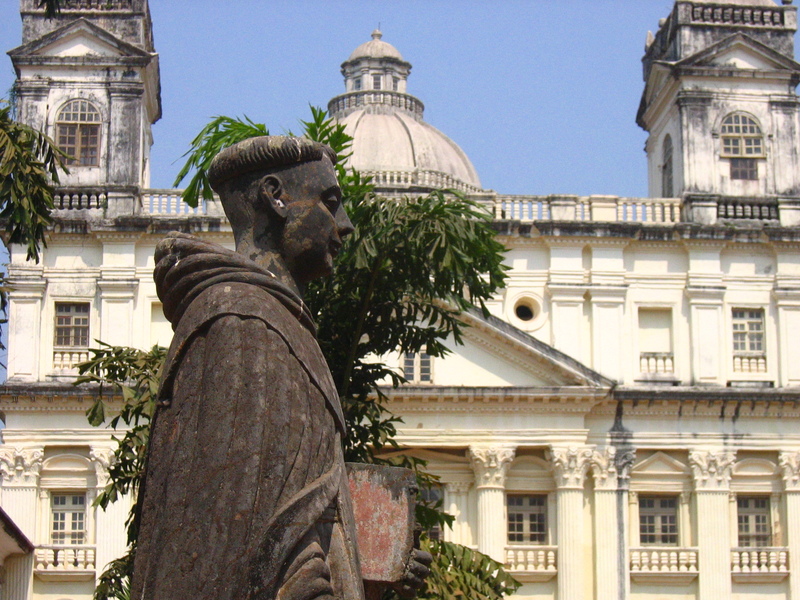 Old Goa is a World Heritage site and a good walking tour of old churches and conversion sites from the 1500’s. In the Basilica of Bom, you can view the preserved body of Saint Francis Xavier, the patron saint of Goa. Shopping. 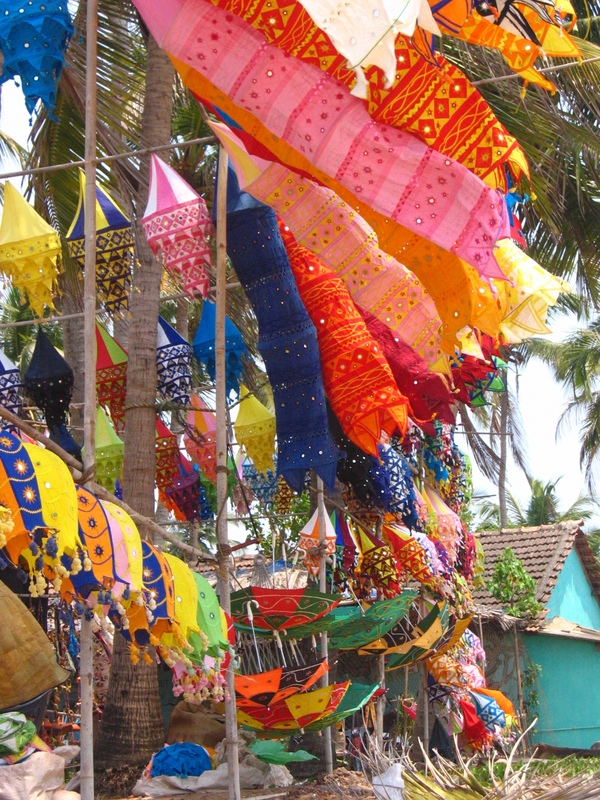 The Global Village market in Anjuna on Wednesdays sells great souvenirs and take-home items, but be warned that many of the same items (claimed to be hand-made in Goa) can be found in other markets around India and even in markets in Europe and South America. Haggle hard. Be aware of extremely aggressive women and young girls who will grab you and force you to look at their items for sale, though it’s okay to say no and walk away after looking at them. Activities. People-watching is especially fun, from the man-in-tatters doing exercises on the beach to the European tourists who think they’ve turned Indian. 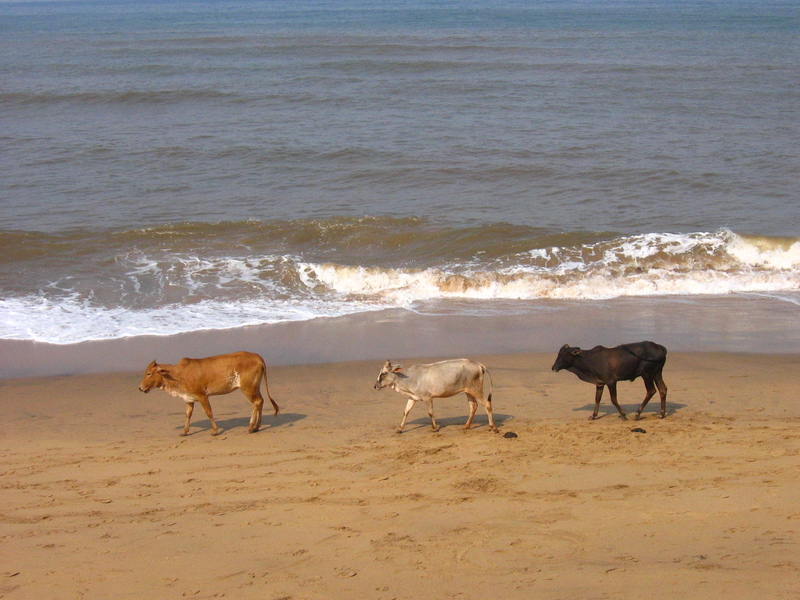 Cow-watching is just as fun – they enjoy the beach as much as tourists do. If you must, there are yoga centers around the area, but don’t be surprised if classes cost the same as they do back home and are run by blond women from London or California. Eat delicious seafood in banana leaves and drink fruity lassi (shakes); be aware that during full moon parties, the “Magic lassi” contains items that are not necessarily yogurt and fruit. 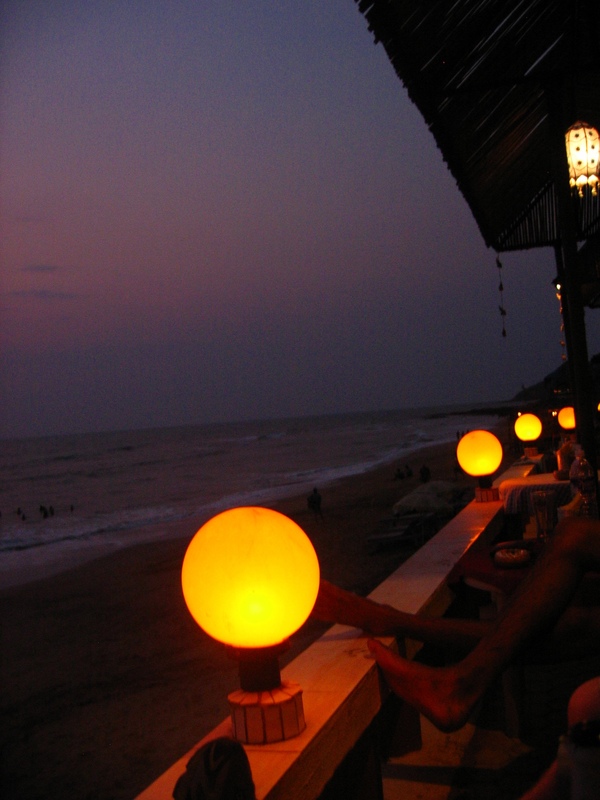 Full moon parties occur all the time on Anjuna, with drugged-out European backpackers swinging their dreds and braided hair to rave music all night long. Getting Lost In: San Diego! Really, there is nothing quite like touching down in 75-degree weather when the rest of the country is experiencing a cold spell, even in Miami (24 degrees?!). And after staring down from your plane window at miles and miles of white squares across the whole country, it’s no wonder that southern California has its share of tanned airheads – no cold front to bring them back down to earth, even for a short winter. Not that I’m complaining, as we were thrilled to arrive even into a 50-degree evening into LAX. We took our rental car down the next day to San Diego to visit my friend Josh, who recently moved near La Jolla (the posh part of town). San Diego is an incredibly beachy town, and the residents move there to surf and play beach volleyball, or because they’re stationed at Camp Pendleton, or because they are doing their residency at UCSD medical school. But visitors come for more than just the beach. Because I haven’t frequented San Diego enough, there’s always something new to see or do in this beautiful weather and town to make a daytrip worthwhile. Sea World/ San Diego Zoo/ Wild Animal Park. These are San Diego’s staples (next to the beach), good ways to pass an entire day and spend $70 in one place, especially if you have little ones. Sea World is even more interesting just because it has aquatic creatures and you’re near the ocean, so if you’ve never been, it may be worth the visit. Kiddos 3-9 are only $59! The Zoo costs less – $37 for adults, $27 for kids 3-11, and you can get a $70 pass to both Zoo and Wild Animal Park ($50 for kids) or even a combination Zoo-Wild-Sea for $121 ($99). The Wild Animal Park allows you to wander among the animals and pet giraffes who roam freely, while the zoo houses the famous and adorable pandas. Torrey Pines State Reserve. For some easy and incredibly scenic hikes along the cliffs above the ocean (beware of crashing cliffs! ), head to Torrey Pines State Park. Dramatic cliffs, caves and erosion that makes it look like Bryce Canyon line this coastal area, where softball-sized seaweed and smooth rocks dot the beach. The beach is also packed down enough for runners to have a long length of running course. It’s $10 to park inside, but if you park your car in the lot right outside the entrance, you can walk on in for free. Watching harbor seals on the beach. At Casa Beach in La Jolla, many friendly seals ork their way onto the sandy shores to tan in the sunshine. This area can be roped off in winter when the pups are born, but still visible. Gas Lamp Quarter. Now here is a wonderful example of a city really pushing its revitalization efforts (San Antonio’s Riverwalk; Culver City, Calif; downtown St. Louis, Missouri). 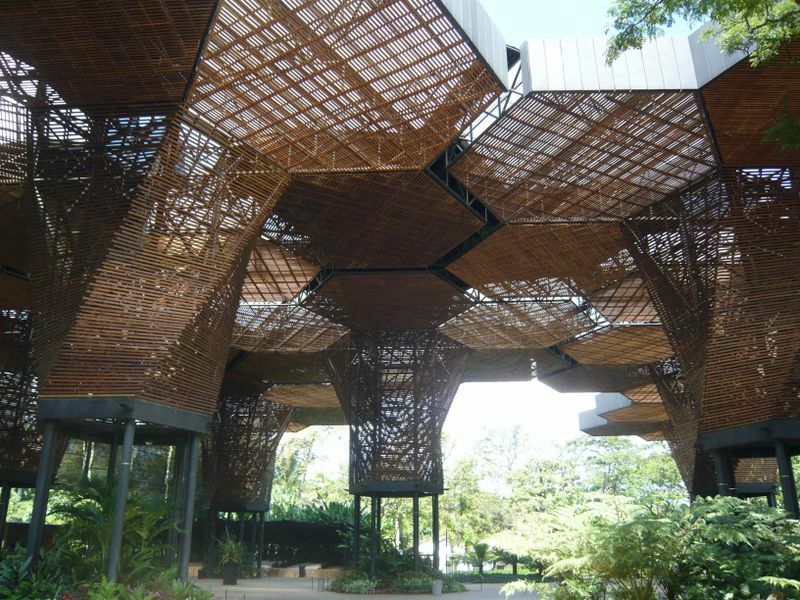 Fortunately, it’s a little less Disney-like than what some other cities have done. A walkable, slightly touristy, slightly trendy historic neighborhood lets you park your car and roam through the restaurants, bars and shopping scene. There are plenty of fine dining options, but I’d like to plug Acqua Al 2 (322 5th Ave, 619-230-0382) which is famous for its blueberry steak. I have actually only been to its other location in Florence, Italy, and if the food is anything as phenomenal as it was there, then you’re in for a tremendous culinary experience. Las Americas outlet shopping. It’s home to all your favorite outlet stores, and includes one of few Neiman Marcus Last Call outlets (anyone want a pair of Jimmy Choo for $100?). But what’s mostly fun about this place is its proximity to the Mexican border, where you can see the Mexican flag waving large and proud on the other side. Wavehouse. Okay, so the ocean is right across the street, but there’s the Wavehouse at Belmont Park in Mission Beach, featuring the Flow Rider. It’s a wave machine on which you ride either a boogie board or a little skateboard without wheels. There’s also an outdoor bar and dining scene surrounding the Flow Riders, and occasional concerts and parties. I’ve experienced riding one during my days as editor of Aquatics International, and was pretty terrible at it. While you’ll probably wipe out endless times before you get the hang of it, it sure beats riding that rickety wooden roller coaster next door which left me bruised and very sore. Getting Lost In: The Outer Banks, North Carolina! Only until a year ago did I even hear of the Outer Banks of North Carolina. And it’s still under debate whether it’s a series of islands or a peninsula and an island; nevertheless, it is basically a very skinny strip of land where, at some points, you can stand at the middle of a residential hill and view the ocean on one side, the sound on the other. The Outer Banks are flanked by beaches on both sides and crashing waves, with enormous houses wrapped in wood shingles and wearing outdoor decks like inner tubes, where the upstairs is downstairs and the downstairs is upstairs and about five or more families can all stay together under one roof. We were fortunate to get my friend Sara’s family’s vacation property in the northern town of Duck, and they have a pool and hot tub, and two decks, and ocean views, and a hammock, and a giant picture window on the main floor with a shipswatch corner, and all the wonderful things that should be found within a dreamy vacation house. We added our bikes and Mother Nature added some excellent autumn sunshine to round it all out. If you plan on a similar trip, you should do the same. Eat. We went looking for coffee at Cravings (1209 Duck Road) in Duck and found some delicious fried fish and southern BBQ sandwiches instead. I had the crabcake sandwich. We also dined out at The Blue Point Bar & Grill (1240 Duck Road), which was like a 50’s diner with views and upscale food. I tried the trout on a bed of sweet potatoes. It was delicious. The day before our half-marathon, my friend Jen found herself drinking beers and eating buckets of peel-and-eat shrimp at the Sugar Shack (7640 S Virginia Dare Trail) in Nags Head. Sites. I admit, I never really quite understood what a “dune” was and finally discovered it for the first time. A dune is like a mountain of sand that stretches like a desert, but isn’t as dry, but is just as impressive. Jockey’s Ridge State Park gives you a really great idea of what being stranded in a desert would be like, except it’s more like a giant beach with the ocean far away. People brought kites and snowboards – yes, snowboards, and boogie boards – to go riding down the hills of sand (people with bloody sand burns were spotted, too). Sunset is an impressive time of day to see the dunes. The Wright Brothers National Memorial pays tribute to the nation’s “first in flight” – also North Carolina’s state motto, which has brought controversy with Ohio, where the Wright Brothers’ bike shop was located and where the airplane was built, making Ohio the “Birthplace of aviation”. If history interests you, you can also check out some stuff in Roanoke and learn about Virginia Dare, the first English person to be born in America, as well as the Lost Colony, which apparently (I never knew this before) was a settlement where all the people left and nobody knew where they went. To this day, they still haunt the island. Actually I don’t know if that last part is true, but there is an outdoor theater musical going on in the Outer Banks re-enacting the Lost Colony. Play. Biking along route 12’s bike path is another great way to check out the sites and get some leisurely exercise. The road is fairly flat and easy, unless the winds off the ocean work against you. If you’re a runner, as a very large number of us were this particular weekend for the marathon and half-marathon race, it’s a lovely course for that as well. Of course, playing on the beach is one of the main reasons people come here in summer, and even in autumn it’s still wonderful. Jon attempted an ocean swim which lasted all of one minute, and we gathered numerous seashells with my niece and tried to identify them against a guide to local seashells we found in Sara’s house. Shop. Outer Banks has your fair share of kitschy vacation souvenir and swimsuit shops, but there are a few gems around. Island Bookstore is a favorite of Sara’s, but I didn’t get to stop in. Knitting Addiction in Kitty Hawk was recommended to me by a fellow writer/ knitter who understands the horrific habit of dropping many bills on irresistable colors, textures and varieties of yarn so fortunately for me, I had arrived by bike and with no wallet. There’s also some outlet shopping further south. Of course, there’s always just sitting on the deck with a cold cocktail or beer in hand and watching the ocean waves roll for hours on end. What’s the rush? It’s the south, after all. And it’s the Outer Banks. Aaaah.